So now we’re left with a problem that’s not super typical for daytime TV: how to dispose of the corpse. Later on in the show, they won’t make a big song and dance about the occasional voluntary fatality, because after a while the bodies start piling up, and life is too short, especially in this town. But the first murder is basically a vampire’s bar mitzvah, so they need a little time to make plans and process feelings. Willie looks down at the body, stunned. Willie: You killed him. You killed him! Barnabas: How could I let him live? He knew too much. Which is not a very good defense. This family really does need to invest in some serious legal counsel. 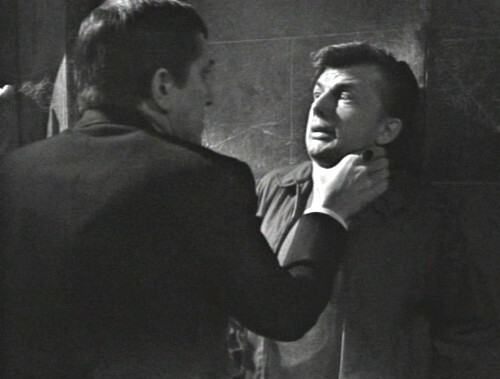 Barnabas wants a little recap about Friday’s episode, so he chokes Willie and pushes him up against the wall to get it. You can always count on Dark Shadows for a good violent recap. 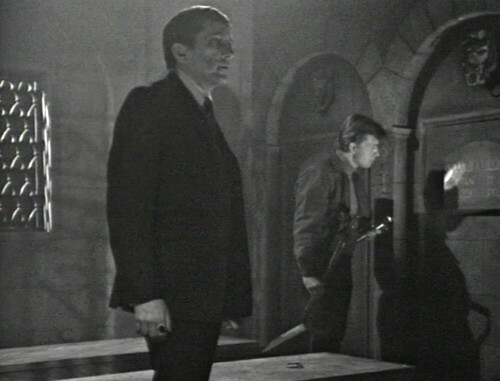 Barnabas decides that the best thing to do with Jason is to bury him in the secret room in the mausoleum. After all, nobody discovered that room for more than 200 years, so it should be fine. Naturally, they don’t realize that the Collins mausoleum is going to get a lot more foot traffic over the next few months. You could set up a hot dog cart on that route; you wouldn’t make a fortune, but you’d probably break even. By 1969, that secret room is basically a public storage locker. Then they do this fantastic theatrical two-shot. Willie: He was always curious about the tomb. And now he’ll be put to rest there… forever. 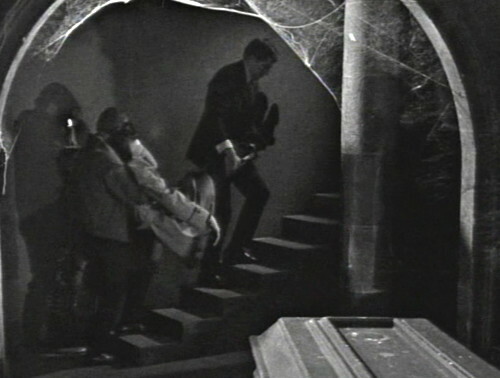 Barnabas: Help me carry him upstairs. As soon as it’s dark enough, we’ll dispose of the body. So that’s fairly grim, and it gets grimmer. Willie walks over to the body, and shudders — he can’t touch it. Barnabas: You constantly surprise me. Are you squeamish about death? Willie: He was my friend. Barnabas: Your friend? But you told me he tried to kill you. Willie: Yeah. But a long time ago, before we came here, we were friends. Good friends. Barnabas: You really are appallingly sentimental. Barnabas: Why? Because I never had a friend who died? 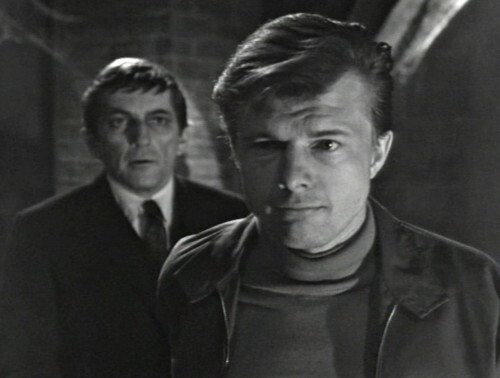 And now it’s Barnabas’ turn to strike a theatrical pose and get all moody and emo. Barnabas: She died when she was very young… and very innocent. She was very dear to me. I mourned her death for a long time. Willie: I wasn’t gonna say that. Barnabas: Well, this isn’t getting our work done. Let’s get it over with. And then they pick up the dead body and carry it up a flight of stairs, because that is a thing that happens on daytime television. Gosh, still a lot left; we’re only up to act two. This storyline was basically offscreen for the last two weeks, so today there’s a lot of catching up to do. 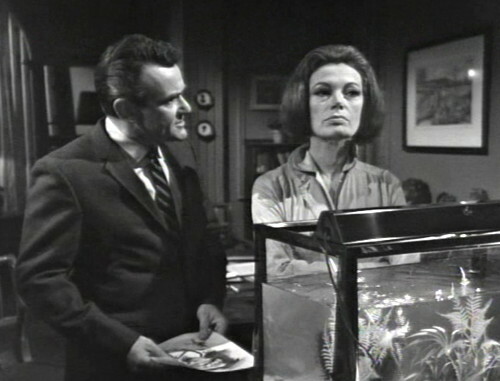 Dr. Woodard shows up at Windcliff Sanitarium to check on Maggie, who spent several weeks being locked up and brainwashed. There’s sort of a long recovery time for that kind of problem. A couple weeks ago, we met Maggie’s doctor, Julia Hoffman, who is smart and fierce and terrifying. Woodard has dropped in unannounced, and guess what, Julia’s not pleased. Woodard has the sketch that Sam drew of the little girl who knew where to find Maggie on the beach. Woodard wants to know when Julia is planning to show the sketch to Maggie. Julia says, “She’ll see the sketch, in time.” And then she walks over to the aquarium and feeds the fish in a marked manner. Woodard believes that finding the little girl will help the police catch the maniac who abducted Maggie. Woodard: I insist that we show this sketch to Maggie today! Julia reacts as if the word “insist” is a brand new concept that she doesn’t care for very much. But Woodard says that he’s going to show Maggie the sketch, and he accepts the full consequences for what happens. The nurse brings in Maggie, who’s still acting like a scared child. 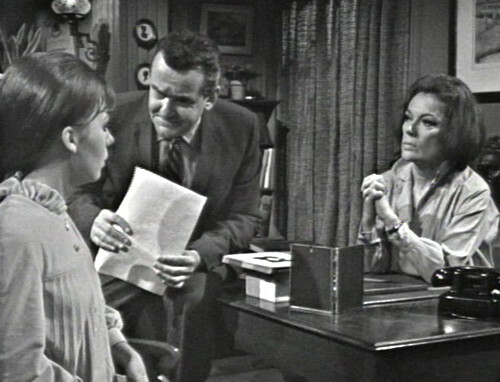 Julia tries to start a therapy session, but Woodard parks himself on the edge of her desk and looms over the patient. Julia is shooting laser beams of death from her eyes directly into his frontal lobe, but he doesn’t seem to notice. At first, Maggie doesn’t recognize the girl, but then a light dawns, and she smiles: “Sarah!” But focusing on that memory starts to bring up the things she’s working hard to forget, and she starts to panic. Woodard puts his hand on her shoulder, and says, “Maggie, don’t be scared; there’s nothing to be scared about!” This doesn’t seem to help. Maggie gets more and more agitated. She starts talking about the riddle, and escaping from the room. She gets up and mimes counting bricks, as Woodard pesters her with more questions. 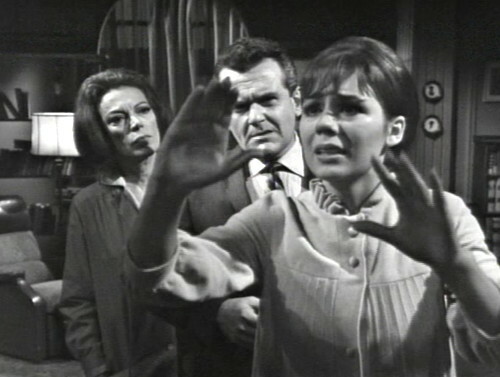 When Maggie starts singing “London Bridge,” Julia finally puts a stop to it and calls in the nurse. Naturally, Julia thinks this was a complete failure and a waste of time, which it was. But Dr. Woodard thinks it was a breakthrough — now they know that Maggie knew this little girl, and if they can find her, then they may be able to catch the kidnapper. The fact that they already knew all of that before doesn’t seem to make a difference for him. Still, as long as he’s happy. 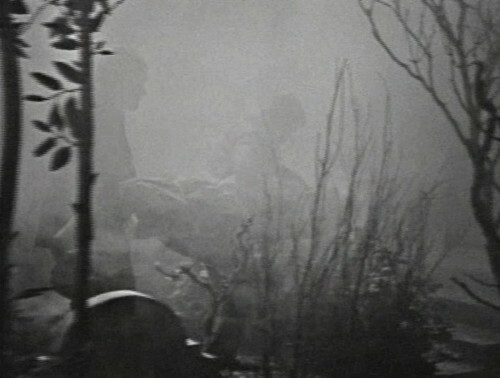 And now back to Super Grim Afternoon Playhouse, for a scene of Barnabas and Willie carrying Jason’s body through a foggy cemetery. Man, the smoke machine is going like crazy today. The mist follows them as they walk into the mausoleum, in a way that fog doesn’t ever really do. They do a little cross-fade to indicate that time is passing, and then we see Willie turning over the last shovelful of dirt to cover Jason’s grave. Now, I hate to be a stickler about a cause of death, but I’m not sure that Jason’s greed is one hundred percent to blame here. Sure, the greed played a part in things, but being strangled by a vampire also contributed. 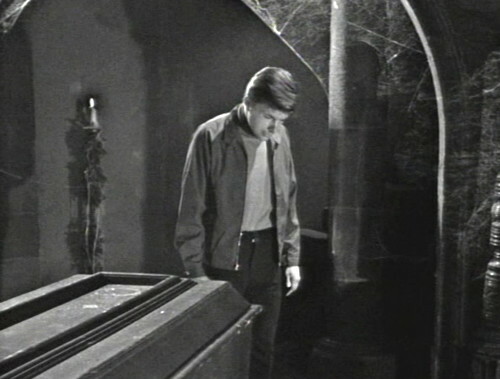 On their way out, Barnabas has another emo moment, talking about his family members who are buried in this tomb. Willie reads the names off the plaques on the wall, and Barnabas has a little comment for each of them. Willie: Joshua Collins… That was your father, wasn’t it? Barnabas: He could have brought me peace, but he didn’t. He thought he was being merciful. What he did was no act of mercy. Willie: I saw a picture of her once, she was very beautiful. 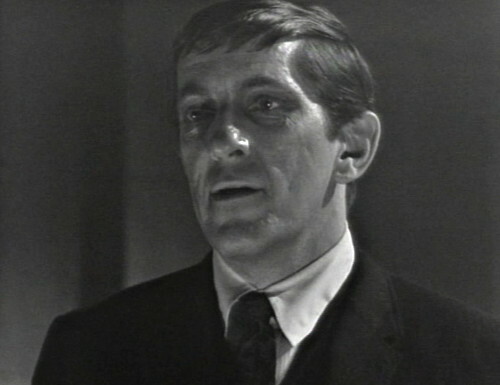 Barnabas: I remember her as being very quiet. She was a very gentle woman. So that’s kind of a mood shift. All of a sudden, Willie’s turned into Barbara Walters, lobbing softball questions and offering a respectful hanky. This guy murdered your friend, and then made you carry him to a graveyard and bury him. Is this really the time for “your mother was very beautiful”? But they have to multi-task; there’s a lot going on. They’re basically rebooting the show, burying the old storylines in a secret room where nobody will ever look for them again. From now on, this is Barnabas’ show. It doesn’t matter whether he’s a psychopathic killer or a brooding romantic — his plans and dreams and feelings are the engine that drives the story. Welcome to his world. 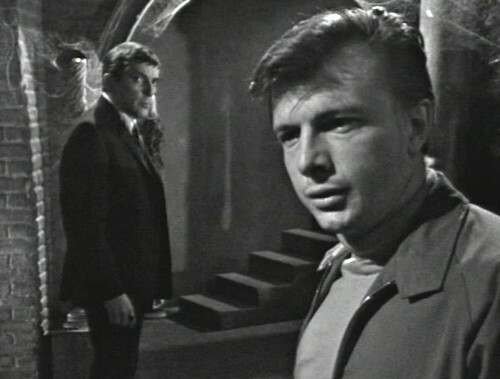 Early in the first scene with Barnabas and Willie in the basement, we cut from a close-up on Willie to a two-shot. The second camera isn’t quite in position yet, and the picture wobbles a bit as the camera moves. When he leaves the secret room, Willie pulls on the ring in the lion’s mouth to close the door. It doesn’t quite close all the way. 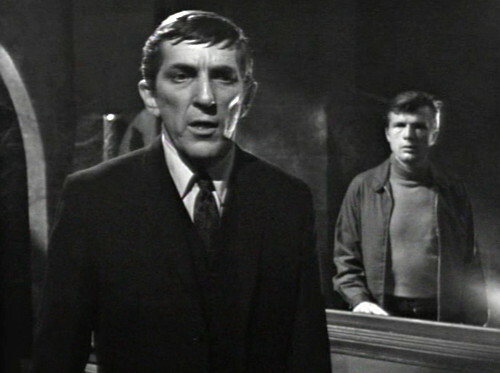 Towards the end of Willie and Barnabas’ conversation in the mausoleum, you can see the shadow of a person walking in front of them. 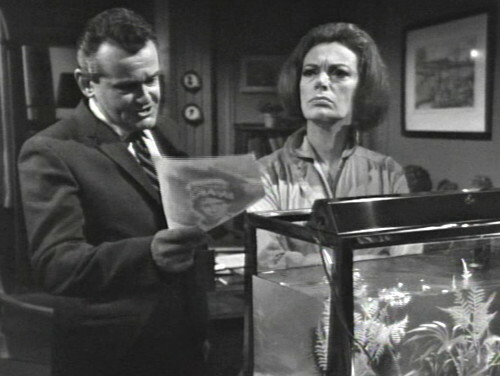 The reprise of Friday’s cliffhanger is unusual, because it’s an actual clip from the previous show. They almost always restage the reprise scene, because videotape editing was expensive, and it was easier just to shoot the scene again. It’s possible that they made the edit here because it was cheaper than paying Dennis Patrick, the actor who played Jason, for a full episode. 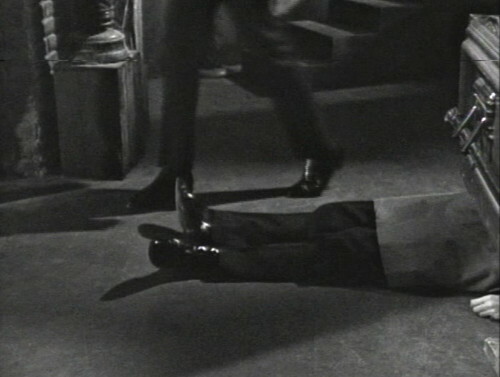 In the following scene, we mostly see Jason’s body lying on the ground. Presumably, that’s a stand-in, but you see his face for a moment, and it sure looks like Dennis Patrick to me. I get most of my information about stand-ins and background players from The Dark Shadows Almanac, because it’s got all the super-detailed nerd knowledge. The Almanac doesn’t mention anyone as a stand-in for Jason here. 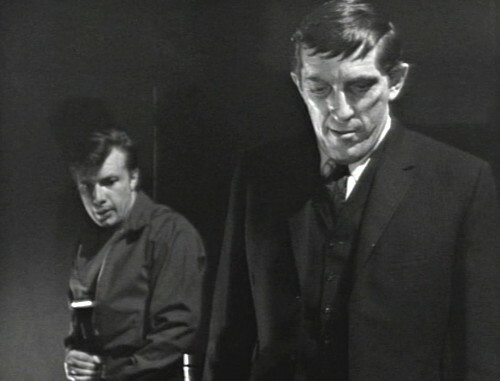 If you’re a Dark Shadows genius and you know who’s playing Jason here, please let me know in the comments! Because I am a huge nerd and I need to know. And why is water in the aquarium down about 5 inches. Aquariums need to be filled to the top cause that’s how the filter works. Are there actually fish or just plants in it? For what it’s worth, I have nothing in my notes about this stand-in, I’ve always listed it as Dennis Patrick. 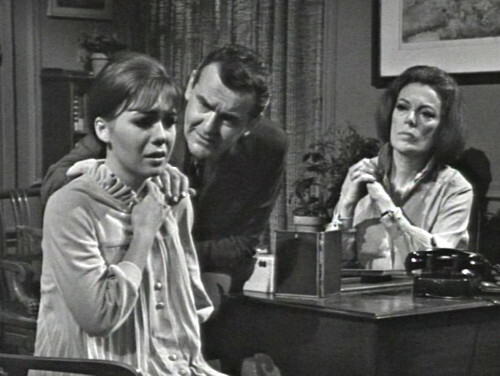 Interesting that in this episode, Sarah died before Barnabas’ curse, before he met Josette. They’ll do a lot of reworking on that as time goes on and Barnabas’ popularity continues to rise. Maybe there was a cheaper price for Dennis Patrick if he didn’t deliver any lines that day? I find it interesting that a vampire who can bend metal bars and risk away adult women in mere seconds out a window needs human assistance to slowly trudge a fresh corpse up some stairs. The coffin that Willie unchained Barnabas from is now in the basement, and the one that he made for Maggie/Josette is now in the secret room. I really loved the shot of Willie training the flashlight straight on to the camera right before he leaves.